Condition: Hardcover, brand new. Red cloth with gilt on spine and boards. 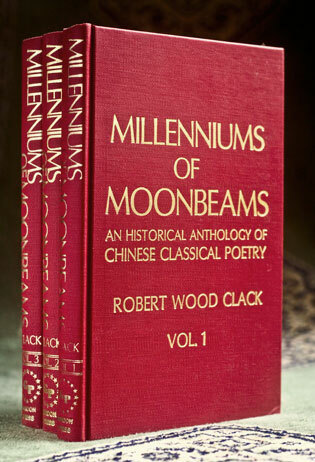 The fruit of 14 years living and teaching in China, “Milleniums of Moonbeams” covers almost 4,000 years, and contains translations into classic English verse forms of 900 poems by some 400 different Chinese poets arranged by period. 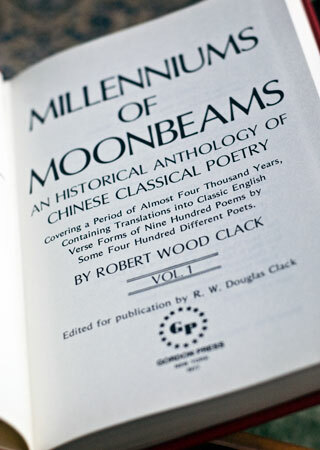 It is one of the most comprehensive translations of Chinese poetry available. 1. Introduction: On translating Chinese poetry. 2. Poetry of the late Chou dynasty. 4. Poems of the Three Kingdoms. 5. The early T’Ang dynasty. 6. China’s two most famous poets: Li Po and Tu Fu. 7. The zenith of the T’Ang culture. 8. The declining years of the T’Ang dynasty. 9. The Sung and Yuan dynasties. 10. The Ming and Ch’ing dynasties.